Michael W. Grebe is the Chairman of the Board of the Bradley Impact Fund and board member of the Wisconsin Institute for Law and Liberty. Previously, Grebe was president and CEO of the Milwaukee, Wisconsin-based Lynde and Harry Bradley Foundation, which has given over $500 million to conservative "public-policy experiments" since 2000 and funds a number of right-wing organizations that have worked to support Wisconsin Governor Scott Walker and his agenda. As of July 2015, Grebe was the chair of Walker's 2016 Presidential campaign. Grebe also served as the chair for Walker's two gubernatorial campaigns in 2010 and 2014 and for his recall campaign in 2012; the latter was at the center of a long-running John Doe investigation into possible illegal campaign finance violations (see below). The Milwaukee-based Lynde and Harry Bradley Foundation, led by Grebe, is "a cornerstone for the conservative movement in Wisconsin and across America," according to the Milwaukee Journal Sentinel. Its core goals have included cutting the social safety net and promoting school voucher programs. One analysis determined that from 2001 to 2009, the Bradley Foundation doled out nearly as much money as the seven Koch and Scaife foundations combined. 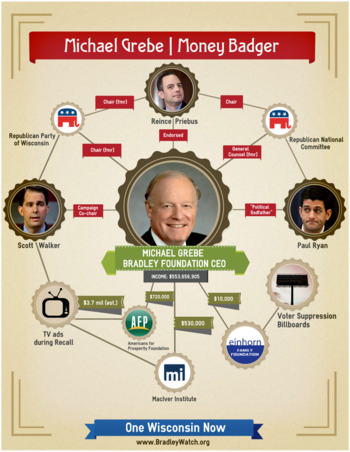 Organizations funded by the Bradley Foundation include the American Legislative Exchange Council, Koch network-affiliated groups including Americans for Prosperity and several State Policy Network affiliates, right-wing media outlets including the Franklin Center and the sponsors of Media Trackers, charter school and school privatization groups, climate-change deniers and a number of Richard Berman’s front groups. "We're part of the right-wing movement," Grebe has told the Milwaukee Journal Sentinel. "We don't hide it." In a 2011 interview, Grebe emphasized the foundation's continued funding right-wing think tanks and advocacy groups. Grebe said he and the board have sought to gain wider exposure for the ideas generated by foundation-funded initiatives. He declined to be specific. But records show the foundation has begun putting money into politically driven social media outlets such as Media Trackers and the Franklin Institute for Government Accountability which produces the right-wing Wisconsin Watchdog new site among others and at least three movie companies - Manifold Productions, Moving Picture Institute and the American Film Renaissance Institute. [...] Grebe said he and his staff are "looking for more ways to affect the popular culture with these ideas so that we're not appealing just to the elites, but we're also attempting to appeal to a broader population." The Bradley Foundation has also given numerous Bradley Prizes to Wall Street Journal editors including Wisconsinite and Editorial Board Editor Paul Gigot in 2010, and Editorial writer Kimberly Strassel in 2014. The Wall Street Journal editorial board wrote countless editorials on the John Doe criminal investigation of Scott Walker and dark money groups between 2012 and 2015, breaking news from subjects of the investigation including Wisconsin Club for Growth leader Eric O'Keefe. Notably these articles came from the editorial board not from the news side of the newspaper. The Washington Post's George Will received a $250,000 Bradley Prize in and as of 2011 received $43,500 per year as a board member of the Bradley Foundation. See the full list of Bradley media award recipients here. The director of community programs at the foundation is married to right-wing radio host WTMJ's Charlie Sykes, who also writes for the Milwaukee Journal Sentinel's online media site Right Wisconsin and edits a magazine published by the Wisconsin Institute for Law and Liberty, a Bradley-funded think tank. See below for information about Bradley Foundation ties to media attacks on the John Doe investigation. As of July 2015, Grebe was the chair of Scott Walker's 2016 Presidential campaign. Before this, he served as the chair of Walker's campaign committee, campaign, the "Friends of Scott Walker" (FOSW), in three gubernatorial campaigns in Wisconsin, including the recall election in 2012. Walker's recall campaign was at the center of a "John Doe" investigation into potentially illegal campaign coordination. (The investigation was ended in July 2015 by the Wisconsin Supreme Court, which ruled that Walker's campaign and conservative groups did not violate campaign finance laws.) See below. Grebe said in an 2015 interview with The New York Times, "At the risk of being immodest, I probably lent some credibility to [Walker's] campaign early on." Grebe personally conducted interviews at the cabinet level of the Walker administration. Less than a week after being elected Governor in 2010, Walker had a private dinner meeting at an expensive Milwaukee restaurant with the board and senior staff of the Bradley Foundation at the invitation of Grebe. “I knew Act 10 was going to be quite divisive and controversial, but it was a very good idea, a good set of policy moves,” Mr. Grebe said. He said all the credit should go to the man in office. According to statements made over the course of the John Doe investigation and numerous related court cases, starting in 2012 a bipartisan group of prosecutors from several Wisconsin counties were investigating whether Governor Scott Walker and his campaign, FOSW, illegally coordinated with supposedly "independent" dark money groups during the recall, including Wisconsin Club for Growth (WiCFG) and Wisconsin Manufacturers and Commerce (WMC). According to evidence made public in the probe, Walker secretly raised millions for WiCFG during the recalls with the express purpose of bypassing campaign finance disclosure laws. Walker’s staff advised the governor to "stress that donations to WiCFG are not disclosed," and to tell donors "that you can accept corporate contributions and it is not reported" and to call WiCFG "your 501c4." Some secret donors later received special treatment from the Walker administration, such as the mining company CEO that donated $700,000, after which Walker prioritized a mining bill; and John Menard, the chain hardware store owner who gave $1.5 million and received $1.8 million in tax credits from Walker's jobs agency. Conducted under Wisconsin's "John Doe" laws, the probe was similar to a grand jury investigation and was overseen by former federal prosecutor Francis Schmitz, who was once considered for a position as U.S. attorney by George W. Bush and who voted for Republican Governor Scott Walker, and involved Republican and Democratic prosecutors in several Wisconsin counties. However, the Wall Street Journal's editorial board characterized the investigation as a "political speech raid," and a number of right-wing groups claimed that the case was politically motivated, led by the Franklin Center's Wisconsin Reporter. No outlet wrote more article about the John Doe than the Franklin Center's Wisconsin Watchdog site. Although the Franklin Center's funding comes primarily from Donors Trust, Wisconsin Reporter's funding in recent years has come in large part from the Lynde and Harry Bradley Foundation. Bradley gave $480,400 to the Franklin Center between 2010 and 2012, $380,400 of which was designated for "state-based reporting efforts in Wisconsin" and "to support Wisconsin Reporter." See Contributions of the Bradley Foundation. the $250,000 awards, a huge sum in print journalism. In May of 2014, George Will, who had emceed the Bradley Prize ceremony, used his Washington Post column to attack the probe, describing the bipartisan investigation as "an especially egregious example of Democrats using government power to suppress conservatives' political speech." Will has been on the board of directors of the Bradley Foundation since 2008. He also received a "Bradley Prize" in 2005, and emceed the 2011 Bradley Prize ceremony, which was also overseen by Grebe. The federal judge who temporarily halted the John Doe investigation, Rudolph Randa of the Eastern District of Wisconsin, is the only federal judge in Wisconsin to attend all-expenses-paid judicial education seminars funded in part by the Lynde and Harry Bradley Foundation. Monroe Freedman, a Hofstra Law School professor and judicial ethics expert, told Madison's Capital Times, and former Waukesha District Attorney Paul Bucher, a Republican, said the evidence " does create an appearance of a conflict." The Seventh Circuit Court of Appeals later ordered the lawsuit in question (originally filed by Eric O'Keefe and WiCFG) to be thrown out, declaring that Randa never should have taken the case in the first place. In June of 2015, Grebe's son, Michael M. Grebe, was appointed and confirmed to the University of Wisconsin System Board of Regents on a party-line vote in the Wisconsin Senate. According to the Associated Press, "Democrats spoke in opposition to Grebe's appointment, saying he was unqualified for the position and was chosen because of his connection to Walker." Grebe reported more than $100,000 in contributions to political candidates in Wisconsin between 1990 and 2015, according to data compiled by the Wisconsin Democracy Campaign (as of July 2015). This total includes $30,400 in contributions reported to Scott Walker's campaigns since 1993. After serving in the Vietnam War, Grebe received a law degree from the University of Michigan, then joined the law firm Foley & Lardner, where he eventually served as CEO and chair. Grebe has been active in the Republican Party, at one time serving as the Republican National Committee's general counsel. In 1984, Grebe was the state co-chair of Ronald Reagan's presidential campaign. According to the Milwaukee Journal Sentinel, Grebe "flirted with a run for governor in 1986." Grebe became CEO of the Bradley Foundation in 2002. ↑ 1.0 1.1 1.2 1.3 1.4 Daniel Bice, Bill Glauber and Ben Poston, From local roots, Bradley Foundation builds conservative empire, Milwaukee Journal Sentinel, November 19, 2011. ↑ 2.0 2.1 Molly Beck, Michael Grebe to lead Scott Walker's presidential campaign, Wisconsin State Journal, July 10, 2015. ↑ 3.0 3.1 3.2 3.3 3.4 3.5 3.6 Patrick Healy and Monica Davey, Behind Scott Walker, a Longstanding Conservative Alliance Against Unions, New York Times, June 8, 2015. ↑ 4.0 4.1 4.2 4.3 4.4 4.5 4.6 4.7 Daniel Bice, Bill Glauber and Ben Poston, "From local roots, Bradley Foundation builds conservative empire," Milwaukee Journal Sentinel, November 19, 2011. ↑ 6.0 6.1 Barbara Miner, Wisconsin's Progressive Tradition at Stake in the Recall Election, Milwaukee Journal Sentinel, May 14, 2012. ↑ Patrick Marley and Mary Spicuzza, Wisconsin Supreme Court ends John Doe probe into Scott Walker's campaign, Milwaukee Journal Sentinel, July 16, 2015. ↑ 8.0 8.1 8.2 Brendan Fischer, "Five Things to Know About the Scott Walker John Doe Ruling," Center for Media and Democracy, PR Watch, July 16, 2015. ↑ Patrick Marley, Daniel Bice and Lee Bergquist, "Walker wanted funds funneled to Wisconsin Club for Growth," Milwaukee Journal Sentinel, August 22, 2014. ↑ Post-Crescent Editorial Board, "Editorial: Mine donation eye-opening, appalling," Appleton Post-Crescent, September 10, 2014. ↑ Michael Isikoff, "Secret $1.5 million donation from Wisconsin billionaire uncovered in Scott Walker dark-money probe," Yahoo! News, March 23, 2015. ↑ 12.0 12.1 Michael Isikoff, "Walker goes Scott-free as state judges shut down fundraising probe," Yahoo! News, July 16, 2015. ↑ Brendan Fischer, "The Assault on Clean Election Laws: The Well-Funded Campaign to Legalize Coordination in Wisconsin and Nationwide," research report, Center for Media and Democracy, January 2015. ↑ "Wisconsin Political Speech Raid," The Wall Street Journal, November 18, 2013. ↑ 21.0 21.1 21.2 Brendan Fischer, "Scott Walker John Doe Ruling and the Well-Funded Assault on WI Campaign Finance Law," Center for Media and Democracy, PR Watch, July 15, 2015. ↑ Lynde and Harry Bradley Foundation, "Board of Directors," organizational website, accessed July 2015. ↑ Stephen Elbow, "Experts weigh in on John Doe judge's Koch-funded 'judicial junkets'," Capital Times, May 30, 2014. ↑ AP, "Senate approves Grebe's appointment to UW Board of Regents," Madison.com, June 9, 2015. ↑ Center for Responsive Politics, Contributions--Michael Grebe, Open Secrets database, accessed July 2015. ↑ Center for Responsive Politics, 2014 Contributions--Michael Grebe, Open Secrets database, accessed July 2015. ↑ Center for Responsive Politics, 2012 Contributions--Michael Grebe, Open Secrets database, accessed July 2015. ↑ Wisconsin Democracy Campaign, Contributions of Michael Grebe, Milwaukee, campaign finance database, accessed July 2015. ↑ Wisconsin Democracy Campaign, Contributions of Michael Grebe to Walker, campaign finance database, accessed July 2015. ↑ 31.0 31.1 31.2 31.3 31.4 31.5 31.6 Bloomberg, Michael W. Grebe J.D. Profile, Bloomberg, June 10, 2015. ↑ Bradley Impact Fund, "About," organizational website, accessed July 27, 2015. ↑ Molly Beck, Michael Grebe to lead Scott Walker's presidential campaign, Wisconsin State Journal, July 10, 2015. ↑ Philanthropy Roundtable, "Michael W. Grebe," organizational website, accessed July 2015. This page was last edited on 14 February 2019, at 21:48.